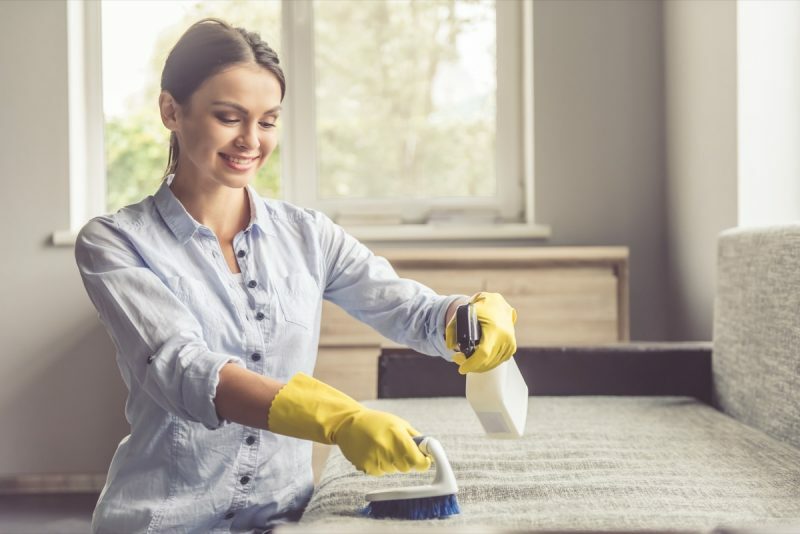 Though some house owners want to save money by trying to clean their upholstery themselves with equipment and cleaning formulas available online, it is best to get them professionally cleaned for lasting results. The main reason for choosing experienced upholstery cleaners is that they bring skill and equipment that has been tested for cleaning dirt, grime, and stains and has been effective. They know which kind of cleaning methods are most effective on a specific type of leather and fabric upholstery and can clean it effortlessly, so your home stays clean and free of germs. All professional upholstery cleaning companies follow two to three stages for cleaning, though all use similar formulae to give your furniture a fresh and new look. Industrial vacuum cleaners are the best equipment to remove the most stubborn sand, dry soil and dust from carpets and furniture. The machine has to be moved to every nook and cranny of the deepest sofas and couches at least three to four times to remove fine dust particles. Sometimes a turbine type hand tool is used to vibrate furniture surface to release hairs and grit from furniture fabric. The dirt can then be vacuumed from the edges to give the furniture a completely clean feeling. If your upholstery has stubborn stains of food, wine, coffee or milk, these are first pre-treated with suitable chemical agents to remove stains without spoiling the fabric. Most cleaning agents comprise of oxidizing agents, enzymes and also anionic and non-ionic cleaners. After the stain is cleaned, the residue left is removed during the final cleaning process. After initial cleaning is done, each upholstery item is treated with an appropriate cleaning agent for the material, which will penetrate the fabric to remove soil, dirt, and grime. The solution is gently inserted into the fabric with a brush that works from all directions. The technique ensures that all embedded particles are bonded with the cleaning solution and can be extracted easily. The embedded dust and grime is extracted from the upholstery with extraction machine, which first injects antibacterial deodorizer. It is done by blowing hot air into the upholstery at high pressure to dislodge remaining dirt and killing all germs. After this step, every inch of the upholstery is vacuumed using a high power extractor to leave the furniture dry and odour-free. Since all sprays of cleaning solution and extraction are done by hand tools with minimal use of pressure, the fabric remains safe and clean. If you require, the cleaning company can suggest suitable stain protection methods for your furniture and groom the fabric to give it a fresh and restored appearance. Some cleaning companies can apply stain protectors on request to your furniture which can stay for at least a couple of years and will protect your fabric against oil and water stains by simply mopping the area. Give your home a facelift with thorough professional upholstery cleaning from Top Cleaners. Call 020 7205 2626 / 0800 051 7626 email or contact Top Cleaners to get your home a makeover.